Twenty-three Jersey youth between the ages of 9 and 20 from 10 states have been recognized by the American Jersey Cattle Association as the owners of the Junior All American winners for 2018. 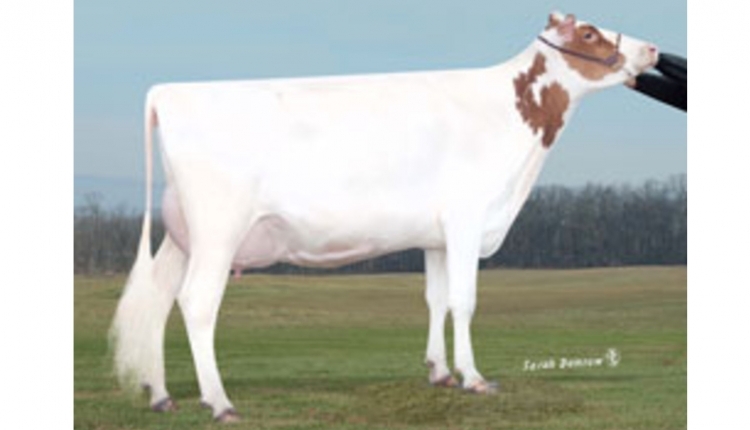 2018 Junior All American Five-Year-Old Cow, SV Impression Holly-ET, exhibited by Grace Sauder, Tremont, Ill.; 2018 Reserve Junior All American Five-Year-Old Cow, Windy Willow Impression Lori J, exhibited by Natalie Berry, Sherwood, Ore. Also pictured, from left, 2017 National Jersey Queen Lakaya Lyon, Clarence, Iowa; General Chair of the 2018 All American Show & Sale, Alan Chittenden, Schodack Landing, N.Y.; and AJCA Director Tom Sawyer, Walpole, N.H. Results from The 66th All American Junior Jersey Show are posted on the USJersey website at http://bit.do/AAJuniorShow, with complete show coverage published in the January, 2019 issue of the Jersey Journal. The All American Junior Jersey Show is an annual production of the American Jersey Cattle Association. For information on sponsorship opportunities or to make a contribution to the Maurice E. Core Jersey Youth Fund in support of Jersey junior exhibitors, contact the AJCA Development Department at 614/322-4456.